The Science and Technology Museum at Catalunya (mNACTEC) has developed a virtual exhibition from the documents and objects used for the exhibition Experimental Physics Laboratory of the Mentor Alsina. The main objective of the virtual exhibition is complementary to the current exhibition: to provide the information, lists of objects and operating proposals that were used to develop an exhibition in which the environmental sense dominates. The virtual exhibition offers information on all objects of the early twentieth century that form the collection of laboratory and interactive elements. As a basis for the interactives, it uses images of the objects; at the physical exhibition, viewers cannot touch them or operate them. Through a convenient menu, one hundred and twenty laboratory pieces of apparatus have been described, grouped into hydrostatic, electricity, mechanics, optics, acoustics and pressure topics. 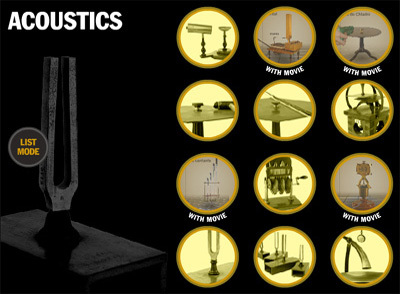 We have created twenty-five short interactives to help viewers understand the operation of all the apparatus. The creation of a virtual exhibition allows for more comprehensive treatment, giving exposure to members of the public who could not likely visit the physical exhibit. The objectives of the Museu de la Ciència i de la Tècnica de Catalunya (Science and Technology Museum of Catalonia – mNACTEC) are to disseminate scientific culture and promote knowledge of it and of its repercussions for society; to promote the industrial heritage (see Figure 1) through the conservation of its collections and by bringing them before the public; and to organise a territory-wide system of museums throughout Catalonia (Muñoz & Guasch, 2005). The Mentora Alsina permanent and on-line exhibition (http://www.mnactec.cat/expo/mentora_alsina.html) projects bring to the fore a collection of 143 scientific instruments that is unique in Catalonia and pay tribute to Ferran Alsina for his valuable work in the dissemination of science and promotion of science as a career. The project has served to bring to the fore the scientific and technological heritage preserved in other private and university collections (Garcia & Villada, 1998-2002 and Valentines, 2004). The goal of creating a physical exhibition has been completed with the development of a virtual project (Fig. 2). The challenge is to develop a virtual exhibition to recreate the characteristics of the exhibition and use digital multimedia resources that enhance the understanding and use of scientific devices. The virtual tour includes several topics: Ferran Alsina, the laboratory, the apparatus collection photo gallery, and a guestbook that permits comments from visitors. Son of a yarn manufacturer, he studied industrial technology and, when he was only twenty, formed a textile cooperative in Roda de Ter (province of Barcelona) and patented a loom with a new system for weaving corduroy (Cabana, 1993). In 1883, the prestigious Catalan businessman Eusebi Güell bought the patent and contracted with Ferran Alsina first as manager of the Vapor Vell mill in Sants and later to organise and manage the Colònia Güell model textile village in Santa Coloma de Cervelló (Anonymous, 1910). At this time Alsina was concerned about the regulation of work by minors (Alsina, 1892) and the reform of working conditions in the Catalan cotton industry. He was an activist in Acció Catalanista and though he did not become involved in politics, he took part in the gatherings that led to the Bases de Manresa (Alsina, 1893), a document that was the road map for Catalan conservatism and protectionism. He published a book on experimental physics entitled Novas Científiques (Alsina, 1904), (based on work by the Anglo-Irish physicist J. Tyndall) that was sent to the Royal Society, in which he describes several physical phenomena, forms new theories and illustrates the experiments used to demonstrate them. Although he applied good methodology in the analysis of certain aspects of physics, his lack of appropriate training led him to lose, in some cases, some of his scientific rigour (Patxot, 1908). The Mentora laboratory of experimental physics was a didactic expression of some of the experiments and demonstrations described in Novas científiques. Ferran Alsina died of tuberculosis at the age of 47. In 1904, in search of a suitable place to live to alleviate his tuberculosis, Ferran Alsina acquired a plot on a long lease from Doña María de la Consolación Vidal de Moragas, marchioness of Morales, for 470 pesetas per month over 30 years, on the east flank of the Tibidabo (Arxiu Administratiu de l’Institut de Cultura de Barcelona, Ajuntament de Barcelona) and commissioned the architect Francesc de Paula Nebot to build a house for him there (Arxiu Històric del Col.legi d’Arquitectes de Catalunya). The ground floor of this house was reserved for the experimental physics laboratory that Alsina named the “Mentora”. The official opening took place in 1907, but Alsina’s premature death delayed its coming fully into operation. In accordance with Alsina’s wishes, the entire patrimony, including the building, passed into the hands of Barcelona City Council and it was administered by a Board chaired by Josep Zulueta (Ajuntament de Barcelona. Comissió de Cultura, 1922). It was at this time that the laboratory began to be known as the Mentora Alsina (Zulueta, 1922). Alsina also left a considerable sum of money to enable the institution to continue its activities and instituted an annual prize for the best invention in experimental physics in Catalonia. 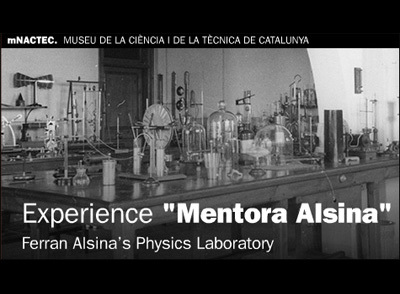 The Mentora Alsina laboratory made pioneering contributions in the Catalonia of the early 20th century to the education of students and the demonstration of physical principles. It was a place that was open to all those with a passion for science and was an active centre of popular scientific education, where every year lectures were organised given by prominent scientific and cultural figures. The way the visits were organised, the development of new activities and correct use of the apparatus were coordinated by Ramon Llobregat, who kept up the original spirit of the Mentora (Parés, 2006). From the 1960s, the laboratory could be visited only by arrangement, and it became a museum of itself. In 1991 the Mentora Alsina was definitively closed, and four years later the Barcelona City Council signed an agreement to donate all the scientific instruments to the mNACTEC. Alsina began to assemble the collection of scientific apparatus in his house in Cantonigrós, near Vic (Barcelona province), whence it was transferred to Barcelona to create the Mentora laboratory (Martí, 1920). The first historical information on the collection is the list of the laboratory’s activities (Anonymous, 1906), which also appears in an almost identical version in Ferran Alsina’s legacy to Barcelona City Council (Ajuntament de Barcelona. Comissió de Cultura, 1922). It lists 103 descriptions of experiments, associated with one or several pieces of apparatus. In apparently random order, it describes experiments in mechanics, pressure, electricity, sound, optics and magnetism. The organisation of the laboratory followed the classic divisions of the period into these six basic fields. During the period when the laboratory was administered by the Board (1908-1930), no new apparatus seems to have been bought (Arxiu Administratiu de l’Institut de Cultura de Barcelona, Ajuntament de Barcelona); there were only a few donations, purchases of material to carry out experiments, and maintenance costs. In 1993, before the Mentora Alsina collection was transferred to the mNACTEC, the museum commissioned a basic inventory of the apparatus and analysis of its condition (Aramon & Segura, 1993), to make it possible to ensure that the transfer of the apparatus could be performed correctly. The report contains 116 entries that represent a total of approximately 140 objects, 13 non-inventoried pieces of apparatus and the items for chemistry, consisting of a collection of more than 200 objects, dating from 1870 until the 1960s. Of the total number of objects, 60 were related to the experiments described in 1906, and the remainder were acquired or built subsequently, during the time when Ramón Llobregat and subsequent directors were in charge. Most of the objects were in a good state of conservation, although their repeated use for didactic purposes and direct contact with chemical substances had left inevitable signs of use, particularly on the more delicate materials. Furthermore, in some cases it was found that modifications, repairs or home-made substitutions had been performed by the Mentora’s staff. The mNACTEC’s restoration laboratory followed two criteria when working on the collection to make it suitable for exhibition: to treat each item as part of a whole, and to preserve the marks left by time and use. The home-made items were respected and minimal interventions (which are always evident) that were needed for the interpretation of each object were performed. The items made of hardwoods and brass, etc., (basically the optical instruments) merely required cleaning. The mNACTEC has brought together all the available information through meticulous research, documentation and cataloguing in order to prepare for the exhibition stage. The Mentora Alsina project springs from and enriches the working philosophy behind the exhibitions held at the mNACTEC (Muñoz, García, Guasch, & Font, 2005). It consists of an eminent museological heritage collection; it creates an atmosphere in the exhibition space suited to the needs of a diverse public; and it includes interactive museological elements that also enable educational workshops to be organised. The Mentora Alsina exhibition occupies a space of 130 square metres at one end of the Museum’s central bay. The scientific instruments are the main attraction of the exhibition from an historical and aesthetic point of view and, without reconstructing the Mentora, its design brings out the character of the former laboratories which were spaces for the demonstration of strange phenomena rather than characterless workplaces. The entire space is designed to transmit an idea of physics that is close to daily life and to do so in a comfortable environment. Special glass display cases have been used to protect the objects being exhibited, and one side of the exhibition has been used to recreate an historical setting containing objects related to the world of physics and the laboratory itself. The items from the laboratory have been chosen using historical criteria, with preference given to those items that certainly formed part of the original Ferran Alsina collection and all the instruments constructed or modified in the Mentora to demonstrate new phenomena. Of the 200 items deposited at the mNACTEC, 143 are being exhibited. They are arranged according to the original, topic-based distribution gleaned from old photographs and descriptions of visits to the laboratory. Supervision by Ramon Pares, the former president of the Royal Academy of Arts and Science of Barcelona and someone who has been familiar with the Mentora since the 1940s, has made it possible to reconstruct some of the craft-produced instruments that could not be deciphered even by specialised physicists. The exhibition project entails two lighting systems: one for the general visit that illuminates the display cases and creates the general ambience; and the other for the physics workshops that take place around a central bench, measuring five metres in length, which is of particular significance, being an original item from the laboratory. The abundant documentation produced during the research phase has enabled us to adopt a three-pronged communicational approach. The basic information about Ferran Alsina, the construction of the building, and the history of the Mentora is located at the exhibition entrance on micro perforated vinyl separated from the rest by ambiental lighting. The creation and characteristics of the collection are described in succinct texts around the perimeter. The need to describe the 143 instruments without swamping the display cases with panels and texts which would have compromised the general aesthetic impression of the exhibition has been met with the use of six touch-sensitive screens corresponding to each section. Touching the photograph of each object on the touch-sensitive screen brings up a panel of descriptive text that illustrates the importance of the instrument in physics and other relevant information. In the case of some of the more complex items, understanding is aided by animated 3-D graphics, devised by the Polytechnic University of Catalonia. In order to help engage visitors on the route round the exhibition, they are confronted with six questions that lead to an answer that is not so obvious as it might seem. What colour is a red box in a dark room? Two interactive displays - the reflection of sound in acoustics, and holographic effects in optics - reinforce this view of the entertaining side of physics. The educational resources are completed by an area to work on experimental physics, aimed at children and students in general. Experiments related with the equipment that forms part of the exhibition are performed using replicas. The aim is to communicate the original spirit of the Mentora as a laboratory for experimentation and demonstration. The project to reclaim the Mentora Alsina has created, in a museum focused predominantly on industrial heritage (http://www.mnactec.cat), an on-line exhibition that recovers a vision of science in which the demonstration and the development of new scientific theories is the basis of training and of leading students towards careers in science. In order to achieve this, the Ferran Alsina collection of scientific instruments has been brought to the fore by exhibiting more than 140 pieces of apparatus in a setting that recreates the old laboratory and incorporates new technologies to better explain how they worked. The exhibition area is complemented by a space for students to do practical work. In this way, the project contributes to the dissemination of scientific culture through heritage items, in a similar fashion to projects by eading science museums elsewhere in Europe. Ajuntament de Barcelona. Comissió de Cultura. (1922). Llegats i donacions a la ciutat de Barcelona per obres de Cultura. Barcelona 1922. pp. 29-49. Alsina, F. (1892). Observacións sobre la reglamentació del treball dels nois en tallers i fábriques. La Reinaxensa. Barcelona. Alsina, F. (1893). Criteri economich general catalanista. Treballs llegits en las Asambleas de Manresa (1892) y Reus (1899). La Reinaixensa, Barcelona. Alsina, F. (1904). Novas cientifiques. Imprenta de Henrich y Comañia en Comandita, Barcelona. Anonymous. (1906). Índice de los aparatos y demás elementos de estudio expuestos en la “Mentora”. Imp. Henrich y Cia. Barcelona. Anonymous (1910). Colonia Güell y fábrica de panas y velludillos de Güell y Cía. Breve reseña histórica escrita con motivo de la visita hecha á dicha Colonia por los Señores Congresistas de la Semana Social (sic), Barcelona. Aramon, J. & R. Segura (1993). Report, Museu Mentora Alsina. Barcelona. Cabana, F. (1993). Fábriques i empresaris, els protagonistas de la revolució industrial a Catalunya. Enciclopedia Catalana, Barcelona, p. 452. Garcia, R. & L.A. Villada (1998-2002). Un gabinet de física a cavall entre dos segles: els instruments antics de física de l’Institut “Jorge Juan” d’Alacant. In: Quaderns de Migjorn, Revista d’estudis comarcals del sud del País Valencià, Alicante, pp. 67-94. Muñoz, J., P. García, M. Guasch & E. Font (2005). Áreas de Interpretación: lugares de encuentro. In: Sin ciencia no hay cultura. III Congreso sobre Comunicación Social de la Ciencia. Libro de Actas. Ed. Excmo. Ayuntamiento de La Coruña, La Coruña 2005, pp. 139-142. Muñoz, J. & M. Guasch (2005). Per un patrimoni industrial sostenible. Mnemósine, Barcelona, pp. 159-168. Patxot, R. (1908). La personalitat cientifica de en Ferran Alsina, Estudis Universitaris Catalans, Barcelona. Valentines, J. (2004). Arqueología industrial i ecomuseografia a les universitats. El cas de l’ETSEIB. In: Quaderns d’Història de l’Enginyeria, VI, Barcelona, pp. 127-159. Zulueta, J. (1922). Llegats i donacions a la Ciutat de Barcelona per obres de Cultura, Barcelona. Arxiu Administratiu del Institut de Cultura de Barcelona, Ajuntament de Barcelona. Arxiu Històric del Col.legi d’Arquitectes de Catalunya.